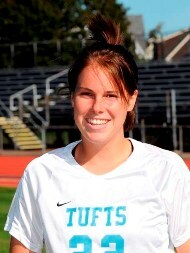 MEDFORD -- The Tufts University women's soccer team is unbeaten and un-scored upon so far in 2008, and the play of sophomore defender Sarah Nolet (Los Altos, CA) has been a key ingredient in the team's success. She has been named the New England Small College Athletic Conference (NESCAC) Player of the Week today for her performance in the team's recent wins over Wheaton and Bates. Nolet scored a goal in each game for the Jumbos. She had the game-winner when the Jumbos traveled down to Norton and defeated #8 in the nation Wheaton College, 2-0. Her free kick toward the upper right corner of the goal frame eluded Lyons freshman keeper Lindsay Leddy's grasp at 41:28. Against Bates at home in the rain on Saturday, Nolet's goal in the 60th minute of play was an insurance tally for Tufts in another 2-0 victory. A 6-foot presence at midfield, she matched last season's goal total with the strikes in back-to-back games. From her position as the defensive center-midfielder for the Jumbos, Nolet also plays an integral role in stopping opponents. The Jumbos are the only team in the league that has not allowed a goal this season. The team's four consecutive shutouts are the most since the 1998 Jumbos strung together five in a row. The 1996 Tufts team opened the season with five straight shutouts. This year's Jumbo side hosts Babson College next on Tuesday afternoon (Sept. 30). Ranked fourth in New England last week, Coach Martha Whiting's Tufts team improved to 4-0 overall and 3-0 in the league.